Almost 20 years ago, Andrea was diagnosed with an “incurable” disease. The doctor recommended destroying her thyroid with radiation. She listened with discernment and said, “No freaking way!” Instead, she focused on healing her body with natural, wholesome foods and improvements in her lifestyle and consciousness. Four months later, her readings had gone from dangerous to just above normal. Two years later, her thyroid symptoms were gone. 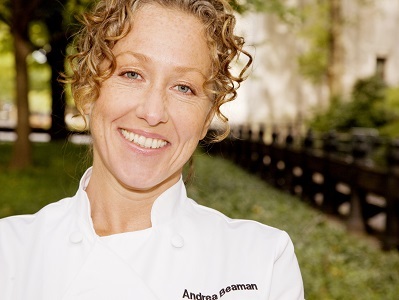 Andrea Beaman is a nationally renowned Holistic Health Coach and Natural Foods Chef. Named one of the top 100 Most Influential Health and Fitness Experts of 2012 by Greatist.com, she is also a recipient of the Natural Gourmet Institute’s Award for Excellence in Health-Supportive Education and a Health Leadership award from The Institute for Integrative Nutrition. In addition to hosting her award-nominated cooking show Fed Up!, she has been featured on Top Chef, The View, CBS news, Fox News, Emeril Live, Dr. Oz Show and Martha Stewart’s Whole Living radio. She also teaches classes and seminars at a wide range of institutions nationwide.